LAS VEGAS – In a place where performers from all walks of life come to make it big, it seemed fitting that Sean Houseworth took over two minutes off his personal best to run away with the win at the Zappos.com Rock ‘n’ Roll Las Vegas 1/2 Marathon on Sunday night. The 24-year-old from Highlands Ranch, Colorado broke free from James Carney and Jason Lehmkuhle with just under four miles to go and held his lead all the way to the tape to win in 1 hour, 3 minutes and 12 seconds. Jason Hartmann of Boulder, Colorado rallied over the final two miles to take second in 1:03:34, while Lehmkuhle held on for third in 1:03:37. Houseworth, a 5K-10K specialist who was making the rare move up in distance, easily qualified for Olympic Marathon Trials with his low-1:03 clocking (the qualifying standard is 1:05), but is unsure if he will run the event in Houston in January 2012. In the women’s race, Australian Benita Willis ran what she called the “best race I’ve had since 2006” to win easily in 1:10:40 – a new event and State record. Runner-up Amy Hastings of Mammoth Lakes, California clocked 1:11:22 followed by Katie McGregor third in a personal record 1:11:45. Willis, who was joined by eventual second and third place finishers Hastings and McGregor through a fast first 5 miles in just over 26 minutes, pulled away from the American duo before the turnaround onto Las Vegas Boulevard, gradually stretching out her advantage all the way to the finish line. The half-marathon wasn’t the only event taking place this evening in Vegas. Ninety minutes before the start of the half-marathon some 8,000 marathoners began their 26.2 mile quest. In the end, it was 33-year-old Kenyan Peter Omae and 23-year old Zsofia Erdelyi of Hungary who came away with the victories in 2:29:13 and 2:48:59, respectively. Clay Wing, 37, of Washington finished second in 2:35:24, with 47-year-old Rafael Cueto third (2:35:56). Erdelyi, making her marathon debut, reached the line completely spent, 38 seconds ahead of runner-up Melanie Peters of White Lake, Michigan. Marnie Staehky was third in 2:55:31. 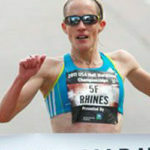 No athletes qualified for the Olympic Marathon Trials in the 26.2 mile race. More than 44,000 registered runners took part in this annual event, including a handful of celebrities: reality TV star Kate Gosselin, who ran her first ever marathon in 4:59:21; Bachelor stars Jason and Molly Mesnick finished the half-marathon in 1:57:07 and 2:17:40, respectively, and Amazing Race contestant Louie Stravato finished the half-marathon in 3:00:43, while Mike McCready, lead guitarist for Pearl Jam, crossed the finish line in 2:11:52. The 4th Zappos.com Rock ‘n’ Roll Las Vegas Marathon & ½ Marathon to benefit the Crohn’s & Colitis Foundation of America is set for Sunday night, December 2, 2012.